With DB Rent’s Call-a-Bike and Nextbike’s MVG-Rad (offered by Munich’s public transportation company MVG) there are already two bicycle rental systems operating in Munich. This April, Danish Donkey Bikes entered Munich followed by Singaporean Obike in August. 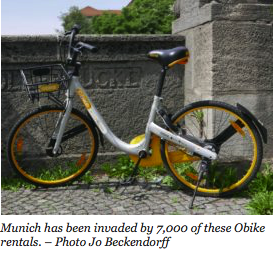 Obike is flooding the streets of Munich with 7,000 grey-yellow rental bikes, leading to serious concerns and anger.